For your business to grow, you need to market your products and services. As a digital marketer, business proposals are the order of the day as they let your prospects know of the services you are offering and the value you bring to the organization. A well-done business marketing proposal could be the ticket to landing your dream client. However, when done poorly, the marketing proposals end up binned with the trash. So, what could be the reasons your proposals end up bringing no business? This article will highlight a few issues that lead to poor conversion rates from a business marketing proposal. Poorly-done business marketing proposals can kill a business relationship before it even begins. The prospective client loses interest within moments of looking at it. Most poor business proposals contain too many irrelevant details that bore most managers to death. 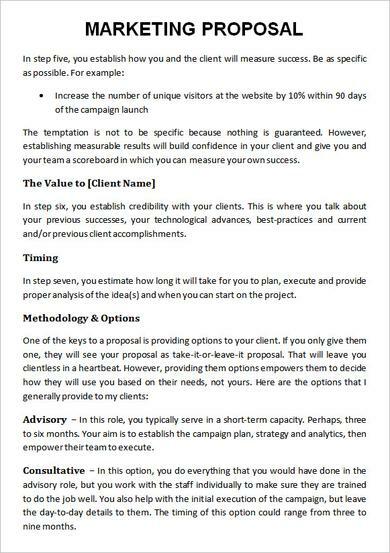 Your potential clients don't have the time to go through extra information they have seen copy-pasted on hundreds of other proposals on their desks. Your marketing proposal thus should not be generic. Take time to study what your prospects want to see. Go online and read from the business owners themselves and you will get a bright idea of what puts them off within seconds of looking at a business proposal. Almost every other generic marketing proposal drones on and on about the skills and accolades on the service provider. However, your prospective client wants to know what value you bring to them, not how good you are at your job. This issue is a thin line since it can be hard to distinguish value from accolades. However, if you have to focus on your company even for one moment, make sure that the intent is to show the value you will bring to the prospective client. Your business marketing proposal is a tool to bring in more business, thus let the potential client know that you fully understand their unique needs, and capitalize on that. Let the prospective client know what's in it for them, and your company will stand out from the many other tech-savvy start-ups clamoring for the limited attention. Despite asking you to stand out from the crowd, remember that a marketing proposal is a BUSINESS tool. Thus, the structure of your business proposal should maintain the standard requirements; otherwise, you risk losing value in your prospective clients' eyes. How can you convince them that you are a great marketing firm yet you cannot piece together a standard marketing proposal? Make sure that your business proposal contains all the right information that you will package in a transparent, concise manner. You need to know what to include, what not to include and how you can bundle that information up in a way that makes sense. This move will save your prospective clients' time and energy, and if they get the motivation to continue reading, you could be on your way to closing a deal. 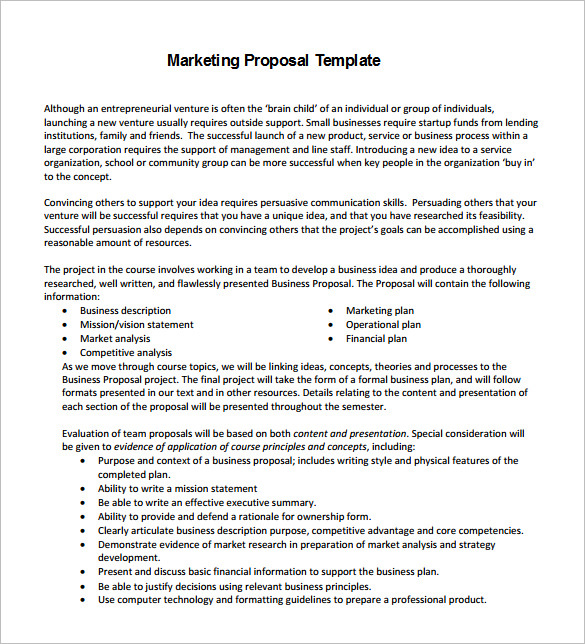 If you don't know how to bundle your business proposal, you can quickly get a great business proposal template online, and you can use it to structure your business proposal to suit the prospective client uniquely. You don't have to start every business proposal from scratch. Having a well-structured marketing proposal makes it more persuasive. A well-structured business marketing proposal identifies your target customers and conveys the value you will bring them in a successful business relationship. When done correctly, the business proposal could help you get unlimited customers, dramatically increasing your company's success.